The Alabama coaching staff has named its Players of the Week for Week 3, concluding with the 52-0 beatdown of Arkansas. Offense: Eddie Lacy and Chance Warmack. Lacy carried the ball 12 times for 55 yards and three touchdowns against the Hogs. Lacy’s touchdown runs were of 6, 1 and 10 yards. Warmack was also named the SEC Offensive Lineman of the Week, helping the Tide rack up 225 rushing yards and not allow a single sack. Defense: Adrian Hubbard and C.J. Mosley. Hubbard and Mosley combined to hold the Razorbacks to less than 150 total yards. Hubbard pass-specialist abilities were suffocating on the Arkansas offensive line with consistency, while Mosley anchored the linebackers on their way to a second consecutive shutout. Special Teams: Cade Foster and Dee Hart. Foster made one of two field goals against the Razorbacks, making one from 50 yards out and missing another from 52. Foster’s 52-yard attempts struck the right goal post. Hart also carried the ball four times for 21 yards for an average yards per carry of 5.3. Throughout the Nick Saban tenure, the Crimson Tide has lived and died by the turnover. In Saban’s debut year, he was robbed of an overtime period with former employer LSU, thanks to a John Parker Wilson fumble that gave the Tigers the ball on the 4-yard-line. That trend was amplified the following week as the Tide lost two fumbles and threw two interceptions in an upset loss to Louisiana-Monroe that has left a scar that remains fresh on the fanbase. Just two years later, Alabama rode turnovers to a national championship. Mark Barron had a key interception in the third quarter that paved the way for an Alabama field goal on the way to a comeback win that kept the Tide in the national championship hunt, not to mention the defensive plays made by Eryk Anders and Marcel Dareus that won the Tide its 13th national championship. Click here to read the rest of my story on the Tide and its conquest to force turnovers. Robbie Neiswanger has been reporting from Fayetteville all week long regarding the quarterback situation, as the college football world awaits final word on Tyler Wilson’s playing status. 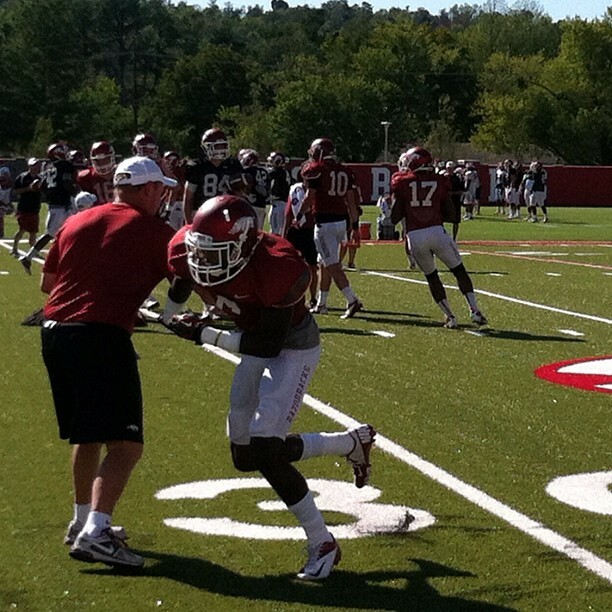 Here are a few tweets from him from the Razorbacks’ media observation period today. 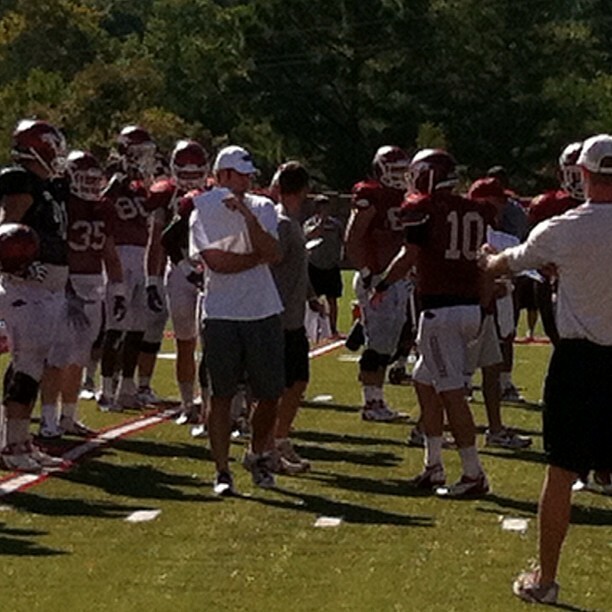 Arkansas QB Tyler Wilson is watching from the field, but not practicing today. Allen, Mitchell working at QB. In his first year on the job in 2011, Alabama head coach Ed Allen may not have known exactly what was coming for him. Surely he knew he was stepping into an elite conference, but the difficulty can really only be experienced, not told. Now, with that experience, Allen knows what to expect and now who to expect, with the release of the 2012 schedule today. Alabama will start its season in Boston for the Beanpot Classic with a doubleheader on August 24th. The will meet Holy Cross and Northeastern on the season’s first day, before ending the tournament the next day against Sacred Heart. The Tide will make its home debut on Aug, 28 against Alabama A&M starting at 7 p.m. before traveling to Elon, N.C. for the Elon Phoenix Classic from Aug. 31-Sept. 1. Alabama will face Elon, North Carolina Central, and Garnder-Webb. A well-earned break will be taken before the Tide hosts the Hampton Inn Bama Bash, which this year will feature five teams: Alabama, Lamar, Austin Peay, Alabama State and East Tennessee State. That tournament will begin on Sept. 7 and end the next day. After hosting in-state Samford on Sept. 11, Alabama will have nothing but conference opponents ahead of it. Alabama will open the SEC slate with a homestand against LSU and Tennessee in Foster Auditorium on Sept. 14 and 16, respectively. Alabama’s matches with the SEC’s newcomers, Missouri and Texas A&M, are scheduled for Sept. 30, Oct. 7, Nov. 2 and Nov. 23. The Aggies will visit Tuscaloosa on Sept. 30, with a return visit coming on Nov. 2. The Tigers will come to Tuscaloosa on Oct. 7 and Alabama will go to Columbia for the regular season finale on Nov. 23. The schedule features two three-game SEC homestands with one four-game road trip. From Sept. 28 to Oct. 7, Alabama will face Ole Miss, Texas A&M and Missouri, all at home. From Oct. 26-Nov. 4, Alabama will face Arkansas, Tennessee, Texas A&M and Mississippi State, all on the road. The other three game homestand, from Nov. 9-18 against Kentucky, South Carolina and Auburn, will be the last action Alabama has in Foster Auditorium for the 2012 season. The following weekend, the Tide will end the season on the road against Ole Miss and Missouri. In yesterday’s meeting with the Razorbacks, it was walks in the bottom of the 12th inning that broke Alabama’s back and cost it a victory. In today’s game, it was a five-run bottom of the third that the Tide could not overcome, losing to Arkansas again, this time by a final score of 8-4. It was a tough day for Alabama starting pitcher Taylor Gilbeau. Gilbeau lasted only 2.1 innings and gave up six hits and six runs (five of them earned). Gilbeau earned two strikeouts and walked three batters. Alabama counted on Cary Baxter and Case Nixon to stabilize things. They did just that, pitching 5.2 innings together and combinging to allow three hits and one earned run. LF Hunter Gregory turned in his second two-hit game in a many games in the series, joined by C Brett Booth in the two-hit club on the day. Alabama will try to avoid the series sweep tomorrow afternoon with the first pitch scheduled for 1 p.m.
To start off a three-game series with the No. 4 team in the country, Arkansas, Alabama showed some great fight but eventually fell 4-3 in 12 innings. Alabama was able to put runs on the board in the top of the third, eighth and ninth inning, only to have the Razorbacks respond in the bottom half of those innings. The game ended as relief pitcher Josh Rosecrans put two runners on base, then Adam Windsor walked two straight batters to give Arkansas the win. The loss is eased by some good offensive production from C Ben Moore, who collected three hits. Hunter Gregory got two hits as well. Alabama got a good start from Charley Sullivan, who pitched 5.1 innings and allowed four hits and one run (it was earned). Alabama will try to rebound from the loss tomorrow, as the Tide take the field to face the Razorbacks again tomorrow afternoon at 2 p.m.